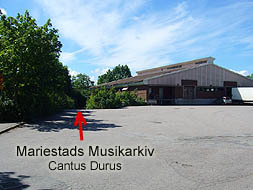 If you're visiting Mariestad and if you're interested in music, you are very welcome to visit us. You'll find the archives in the basement on Kungsgårdsvägen 5. Mariestad itself is located on the eastern shore of the largest Swedish lake, Lake Vänern. Click on the maps (link below the image) to get some more directions. Please make an appointment if you like to visit us. Speak with Agneta at phone +46 (0)72 505 73 15.